Stewart R: During a much needed break from work last week I actually got to catch up on some comics and series I'd been neglecting, yet had stumped up the money for and continued to do so as the New Comic Book Days rolled onwards. It's always something of a weight on the mind to have a growing pile of unread material that builds and builds and you're not entirely sure that some of your purchases are worth continuing with. 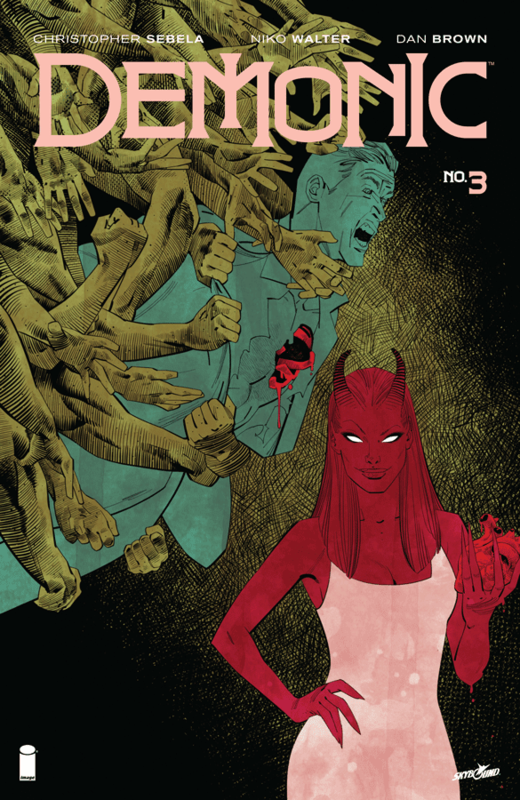 I was honestly not certain that Demonic was a series that warranted buying two issues of without properly casting an eye over - I'd checked preview pages before putting on my pull-list, don't worry! - but having caught up with it over the course of a bus ride I have to say there's something catchy about this dark, crime thriller. Kill Or Be Killed is certainly gaining plaudits for its look at moral ambiguity, potential mental illness and a small sprinkling of dark fantasy elements and Demonic is walking a similar path, but with a little more emphasis on the supernatural side of things and leaning into the super/anti-hero ball park at the same time. The hook with this title, that really sets it apart from its would be Image-published kin, is the police procedural plot which has Detective Scott Graves hiding his activities from within the department itself. There's a delicious mystery to Scott's past which has given rise to his soul-selling predicament and it seems that writer Christopher Sebela is settling us in for the slow reveal in regards to that harrowing piece of history. That same aforementioned bus journey also gave me chance to catch up on Black Panther #5 and #6 which had T'challa fighting and trying to understand the insurgents within his own country as the burden upon his soul continues to weigh heavy. This had been a title hanging on the edge of my pull-list, yet Ta-Nehesi Coates has done a superb job of balancing the political interplay of a King, his people and the viewpoints of those who would dethrone him with occasional explosive action and the odd dose of the wider Marvel Universe poking its head inside the borders of Wakanda without detracting from the main drive of the book. I'd stake a guess that the domestic troubles of this fictional nation may not have held the attention of some readers coming to the adventures of Black Panther following his appearance in Captain America: Civil War earlier this summer, but hopefully the high quality of the writing each month is strengthening the readership along with the fine art from Chris Sprouse. Suffice to say that Black Panther #7 is a sure fire lock in my pull-list tomorrow! Kenny J: A double dose of Jason Aaron books this week. The man who has made this mutant and superhero fan enjoy the myth and mysticism of the magical part of the Marvel Universe. With the culmination of storylines in both Doctor Strange and the Mighty Thor he’s about to send us off on more adventures through the otherworldly realms of the Dark Dimension and Asgard respectively. After being sapped of his powers by the Empirikul, the enemies of Stephen Strange are looking to take advantage of his weaken state. First up is Baron Mordo and wherever he goes Dormammu is not far behind (and he's a character I’m really looking forward to seeing rendered by Chris Bachalo). Aaron has no less an artist in Russell Dauterman on Mighty Thor as we get the secret origin of Mjolnir, Thor’s trusty hammer and the implement tasked with deciding who is deemed worthy or not. As the now 'Unworthy' Thor has lost his trusted weapon so has Tony Stark, and not for the first time. Another supergenius well known for wearing suits of armour takes on the mantle of the Infamous Iron Man in issue #1 by Brian Michael Bendis and Alex Maleev. Unfortunately that person is Victor Von Doom. I've really enjoyed this pairing’s work on International Iron Man and the story BMS has been creating at large. The possibilities of having Doctor Doom as one of the lead Avengers just makes this title ever more interesting. The last book I'll be picking up this week is Dark Knight III #6. As this book nears it's conclusion I think it's been a success. What could have been an unwieldy mess has been an enjoyable overblown story fitting of the prefix 'Dark Knight', probably due to Brian Azzarello.